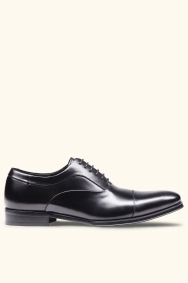 Put your best foot forward in these black Oxfords. 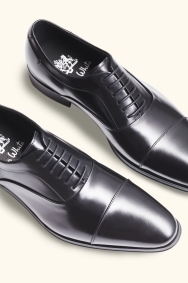 Selecting the right shoes is essential to crafting the ultimate suited look. 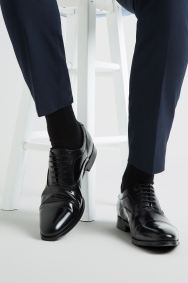 These sleek black Oxfords from Northampton-based shoemaker John White feature leather uppers and soles, along with a leather and textile lining for superior comfort. 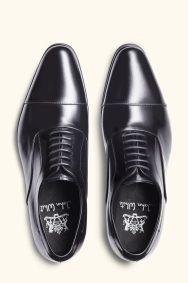 Oxford-style lacing should be your go-to choice for the smartest occasions. Pair with a modern black business suit or a grey wedding outfit for a knockout combination. Really nice comfortable and smart shoes. V stylish for the money. Unclear what their durability will be like yet. No pinch points, although I had to fiddle a bit to get my foot in the first time. Also - for taste - the toes are quite long! Nice quality, worth the price. The product itself was high quality and reasonably priced. Good quality product. Looks good with suit. Excellent quality, lovely pair of shoes.